An article in this week’s Chronicle of Higher Education highlights a wide-spread phishing scam targeting campus leadership. The article correctly points out that, in an effort to quickly respond to a university executive, faculty and staff may not question the validity of the email address the email was sent from. 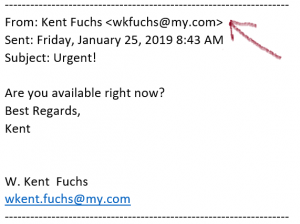 This phishing scam has been used against targets such as President Fuchs as well as deans and vice presidents. Phishing, malware, and SPAM emails attempting to enter the UF Network are a high volume problem: More than six hundred million emails last year were blocked after being identified as email-based threats. UFIT is currently testing tools that would further block suspicious emails. What can you do to protect yourself from these types of threats? Anyone who suspects they’ve received a phishing email in their UF email account should forward it to abuse@ufl.edu. This page was Last updated January 31, 2019.